Hospitals will be told exactly how to clean their wards under new guidelines hoped to cut MRSA deaths. 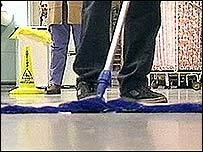 Floors should be cleaned four times and toilets three times a day the government rules say. Its target is to halve the superbug's infection rate by 2008. Critics say more resources are needed to meet the ambitious target. Spot checks showed 90 out of 1,184 hospitals have poor or unacceptable cleanliness. When they were re-inspected by the Patient Environment Action Teams, after being ordered to take action to improve their premises, 27 were still below standard. The new guidelines for trusts on the contracting of cleaning services sets out clear rules and minimum standards for cleaning. Cleaning companies who do not meet these standards will risk losing their contracts. There's a huge piece of work to be done. Following the introduction of compulsory competitive tendering, there had been concerns from some quarters that hospitals were taking up the cheapest cleaning contracts instead of basing their decision on which company would do the best job. The government hopes its recent measures will ensure future contracts for cleaning are driven by quality rather than price. Health Minister Lord Warner said hospitals could go back to contractors and ask to renegotiate contracts in light of the new guidance. But some say there are not enough cleaners to meet the target. Karen Jenning from Unison said: "We have got less than 50% of the staff that we had in 1993 when the contracting out process began. "So there's a huge piece of work to be done." Heather Lawrence, chief executive of the Chelsea and Westminster Hospitals NHS Trust, said ensuring the cleaning standards were met should be a shared responsibility between the hospital and the contractor. "It's important that each hospital resets its contract to have these standards in them. Hospital cleanliness and reducing infection rates are everyone's business. "That's what we have already done. If you have got that then our nurses, the modern matrons working with the contractors, ensure that the standards are met. "It's very important that everybody takes cleaning as part of their responsibility." Michael Summer, chairman of the Patients Association, welcomed the guidelines saying it was something they had been campaigning about for months and months. "It is so important to get the cleaning right. "MRSA is killing people at the rate of at least 5,000 if not many more every year." He said the UK had become the dirtiest country in Europe. "The problem is that as one patient leaves a bed another is just about to occupy it which means you do not have time to clean the beds. "In other countries they actually rotate the beds so that the infection is carefully monitored." Health minister Lord Warner said: "Hospital cleanliness and reducing infection rates are everyone's business. "This guidance sets out clearly how often different areas of a hospital should be cleaned and what level of cleanliness is required. "This means both hospitals and cleaning firms know what is expected. This is just the latest step in our drive to improve cleanliness and lower rates of infection." Also announced on Tuesday was the positive uptake of a National Patient Safety Agency campaign which requires all hospitals to have alcohol hand rubs near every patient and information posters to encourage good hand hygiene. This has been implemented by about a third of trusts so far. Chris Beasley, chief nursing officer for England, said: "The uptake of the CleanYourHands campaign is another encouraging sign of the staff and patients in the NHS working together to combat infection." Conservative shadow health secretary Andrew Lansley said: "Blair's government is all talk on hospital cleanliness. "We have a comprehensive 10 point action plan to eliminate the superbug, and we will take action where it counts: shutting down dirty, MRSA infected wards." Paul Burstow MP, Liberal Democrat shadow health secretary, said: "Government targets hamper the effort against infection. "Frontline staff should be free from red tape and political interference so that they can get on with the job of treating patients, and preventing infections." Next week a science summit on hospital acquired infections is due to take place. Since this list was drawn up some of the trusts have taken action to improve cleanliness and may no longer be rated at this level. What can you do about the hospital 'superbug'?